Natural disasters, such as hurricanes, floods, fires, earthquakes, and tornadoes, can often strike quickly and with little warning. When faced with an emergency situation, preparation is key to ensuring the safety and security of loved ones, including your pet. While many pet owners have thought about disaster situations, they are unsure of how they would care for their pets if such an event occurs. In order to make things a little easier, Heidi Ganahl, CEO and Founder of Camp Bow Wow, North America’s largest and fastest growing pet care franchise, has these great tips on how to protect your pets should your area be struck by a natural disaster. Have a Safe Haven – If, for some reason, you are away or cannot get to your pet when disaster strikes, find a local dog day care, friend or pet sitter that can reach your pet. You never want to leave a pet behind in an emergency as they, most likely, cannot fend for themselves, or may end up getting lost. Try and make plans ahead of time to evacuate to somewhere like a pet-friendly hotel or a friend or family’s home that is out of the area. Make Sure Vaccinations are Up to Date – Should your pet need to stay at a shelter, important documents pertaining to vaccinations or medications will be crucial. Ensure their vaccinations (including bordetella) are up to date so you don’t have any issues leaving your pet in a safe place. Microchip Your Pet – Even when you first get your pet, getting a microchip could be the difference between keeping him/her safe and making them a stray. Microchips allow for veterinarians to scan lost animals to determine their identity so that they are safely returned home. It is important to ensure that your microchip is registered and up to date so if your pet is lost, when the microchip is scanned, your information is accessible to whoever recovers your pet. Stock Up on Food & Water – Enough water for your pet is crucial. Never allow Fido to drink water immediately after a storm as chemicals and bacteria could be abundant in tap water. Also, be sure to stock up on at least 1 week’s worth of canned food. Don’t forget a can opener, or buy pop-top cans to last you about a week. Make Fido Feel at Home – Like people, pets will become stressed when their safety is at risk. Whether you are waiting out a storm and relocating to a different area, be sure to bring their favorite toys, ALWAYS have a leash and collar on hand for their safety, and a comfortable bed or cage for proper security. If your pet is prone to anxiety, stress-relieving products, like a dog anxiety vest or natural stress-relieving medication or sprays can help ease them in times of emergency. I.C.E – No, not the frozen kind – it stands for “In Case of Emergency.” If your pet is lost or runs away during an emergency, bring information that will help others find him/her like recent photos of your pet, behavioral characteristics or traits. These can help others identify your pet and return them safely to you. 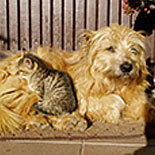 Rescue Alert Sticker – Put a rescue alert sticker on your home to let people know there are pets inside your home. If you are able to take your pets with you, cross out the sticker and put “evacuated” or some other words to let rescue workers that your pet is safely out of your home. Ease Pets Back Home – Don’t allow Fido to run back into your home or even your neighborhood once you and your family have returned. Your once familiar home could be disheveled and/or changed, and this can potentially disorient and stress your pet. Keep your pet on a leash and safely ease him/her back home. Make sure they are not eating or picking up anything that could potentially be dangerous, such as downed wires or water that could be contaminated.